The fillings are endless. Chocolates and Nutella, jams and fruits, cheese and vegetables — crepes are never-ending fun, both for eating and for making. As Emma and I discussed what to make last week for one of our final dinners at home, we decided to take a trip to France for some crepes. 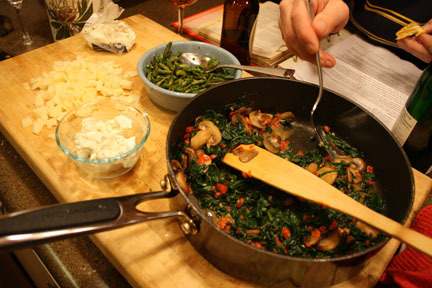 Obviously we had to pull out Julia Child’s “Way to Cook” for her recipe, who else could we turn to at a time like this?! 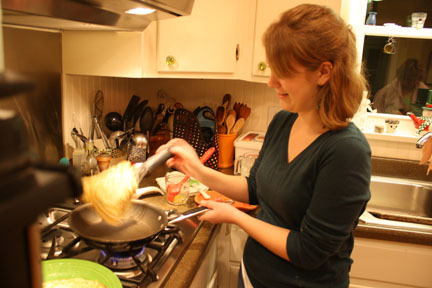 Neither of us have ever made crepes — years ago I remember my uncle flipping crepes for breakfast for many extended family members, but I don’t think my immediate family has made them, at least for a really long time. So maybe not perfect, but a few holes and lumps didn't hurt our crepes. Emma and I did our research, analyzed Julia’s recipe, searched other cookbooks and websites for vegetarian fillings, created a grocery list and hit up Fresh Market. 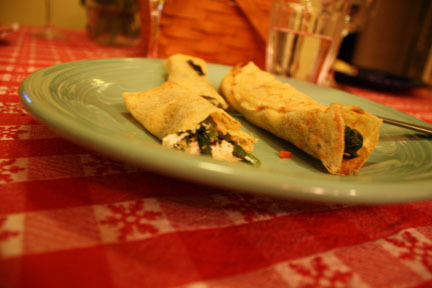 Crepes are a thin pancake that can be made of various types of flours and either sweet or savory. 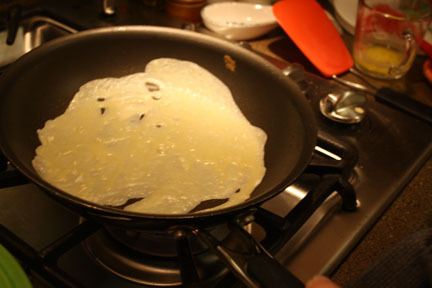 The word crepe even means pancake. Julia’s recipe was just a simple mixture of flour, milk and water, eggs and butter. (Though, it was Julia, so really, nothing is simple. I'm not the best at flipping. Emma is an expert though. We had no instant flour or whatever it was in our cupboard, so Julia suggested straining the batter to take out lumps caused by all-purpose flour. Not the easiest thing ever. So we just left a few little flour lumps in there and they turned out just fine.) After letting the batter sit, we heated up a small pan and brushed on melted butter. My first attempt was a complete failure. The batter didn’t smooth out and I am too impatient and didn’t let it cook for the minute or so before I was ready for it to flip. It wasn’t ready to be flipped though, so then it started to look like scrambled eggs. My mom showed us how to pour the batter into the pan while swirling it immediately to make an even layer in the pan, like an omelet. After a few set up like a pancake, Emma became a pro at flipping them, and was even able to flip with the pan. In the meantime, we also made two different vegetable fillings: asparagus with herbed goat cheese, and spinach, mushrooms, roasted red peppers. So delicious. The spinach combination was rich with lots of butter and garlic, so much flavor wrapped up in what could otherwise be a plain meal. And then there was dessert. Chocolate chips, caramelized bananas and Bailey’s Irish Cream filled crepes one rainy day that Ryann and I were exploring Galway, and they were what heaven could be compared to. I tried to recreate those the other night, and while they weren’t quite the same (and we luckily weren’t standing under an awning as rain poured down), they were pretty close and delicious.